Be the first to share your favorite memory, photo or story of Coy. This memorial page is dedicated for family, friends and future generations to celebrate the life of their loved one. Coy Smith, 93, of Manchester, KY, passed away Monday, April 8th, at the Advent Health Manchester Hospital. Coy was born on April 5, 1926, a son of the late Hannah and John Smith. He served in the U.S. Army as a PFC in WW II. Coy is preceded in death by his wife, Lila Marie Smith. He is survived by his son,Coy I. Smith, Jr. of Manchester. He is also survived by his niece, Jeanne L. Collins, and great niece, Betty Ann Alevras. 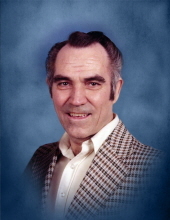 In addition to his wife and parents, Coy was preceded in death by the following brothers and sisters: J.B. Smith, Reamie Smith, Lester Smith, A.C. Smith, Essie Hamlin, Fronia Chavies and Nina Gray. Services will be held at 11:00 AM on Friday, April 12th at Britton Funeral Home in Manchester, KY, with Mike Cottongim officiating. Burial will follow at the Manchester Memorial Gardens. Visitation will be held 6:00 PM on Thursday, April 11th at Britton Funeral Home in Manchester, KY.
To send flowers or a remembrance gift to the family of Coy Smith, please visit our Tribute Store. "Email Address" would like to share the life celebration of Coy Smith. Click on the "link" to go to share a favorite memory or leave a condolence message for the family.